Product variations are variable products like a chair that comes in three colours. Without adding product variation your product feed will only show you 1 product. With product variations your feed will show in this case 3 products each product with their own colour. 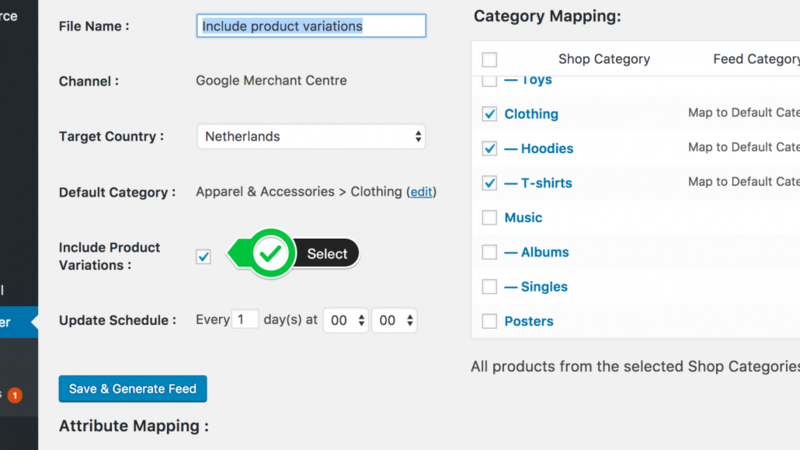 After mapping your shop categories you can select the checkbox “Include Product Variations”. When you select this your product variations will be included as separate products in your product feed. The plugin will also make sure that the url to the product variation will show the user the chosen product variation without the use of an additional plugin. After selecting the checkbox “Include product variations” you will already have a product feed with separate variations. But there is more to do to have a valid product feed and give the feed channel more information about the product variations. Normally we show only the product title with the Title attribute. When we include product variations we would end up with duplicate titles. To avoid that and give the channel more info about the product we will combine source fields to add the variation to the title. Select Combine source fields and choose Product title and combine it with the attribute source fields from you attributes. In the example above we have only one attribute combined but you should add all relevant attributes your products have. Channels can use the item group id to identify which product variations belong to each other. The item group id will add an id to each separate product variation grouping them together. For Google shopping this is a required field when you include product variations. Add under Optional the attribute item_group_id. It will automatically be populated with an id grouping the product variations together.